-★【Super Long Charging Time】★: This powerful 6000mAh Li-polymer rechargeable battery case can effectively provide 200%+ extra battery life for your iPhone 8/7, up to 17 hours talk time, 12 hours on web browsing time ,60 hours listen music ,13 hours video. 3 hours 3D gaming. Which helps to keep your phone charged the entire day, do not need to worry the battery run out suddenly. -★【Advanced Sync-through Technology】★: Simultaneously charge your phone and iPhone 8 / 7 battery case charger together, conveniently sync your iPhone to your Macbook, PC or laptop without having to take the battery case off. 100% compatible with all iOS versions, Apple Pay, and future iOS software updates (Apple Car Play is not supported ). 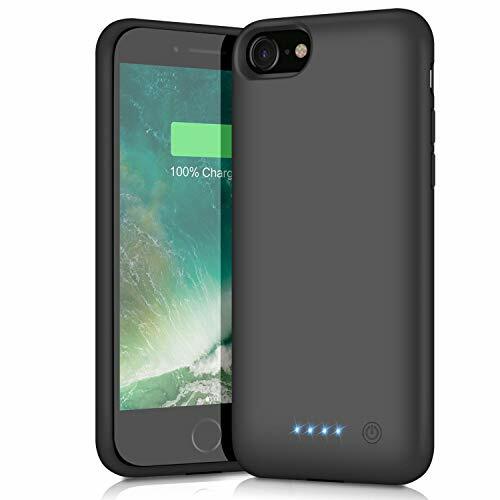 -★【Charging and Protection 2 in 1】★: The iPhone 8/7 charging case with 360° comprehensive bumper design and hard-shell back-plate, protecting your iPhone 8/7 from scratches and other daily wear and tear. The batteries use Grade A+ batteries with CE and RoHS certification. Internal high quality chips also protect your smart phone from overheating, short-circuiting and over charging. -★【Easy to Install and Use】★: 1. Push the phone along the top horizontally into the bottom of the battery case. 2. Connect phone charger interface to battery case completely, and press two side of phone lightly. 3. 4 LED battery level indicators that let you know how much power you have (0--25%--50%--75%--100%); Besides, you can switch on/off the iPhone 8/7 charger case with the power switch button easily.